L'appartement est calme , la climatisation permet de se ressourcer après des promenades sous la chaleur de l'été. Nous n'avons pas utilisé le balcon car compte tenu de la chaleur urbaine même en soirée, l'intérieur était plus confortable. Cute patio too, but too hot to really enjoy it!, Would be helpful to have English directions for washer and a toaster would be great too. 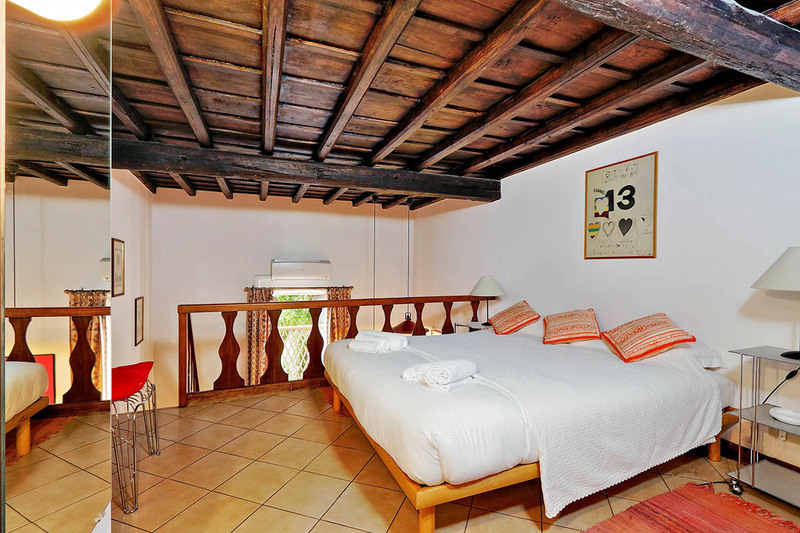 our stay were very good, apartment met our expectations, great location and clean. Only one thing to remark was the dishes weren´t very clean. I stayed for three nights in Rome , meeting good friends and visiting the City . Check- in very easy , Nissar was very kind and professional . 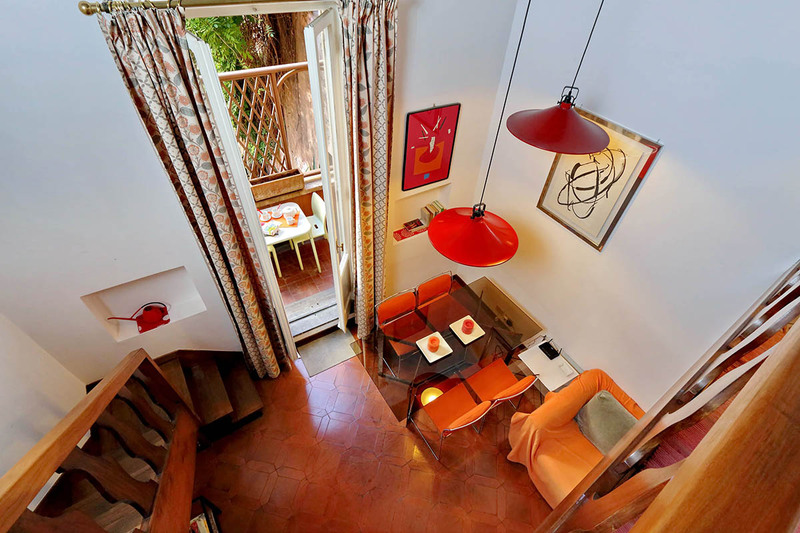 Top location , comfortable spot in the heart of Rome . I' ll be back for sure. I meant to leave a note to say that the shower was draining poorly--slowly and filling up almost to the top of the base. 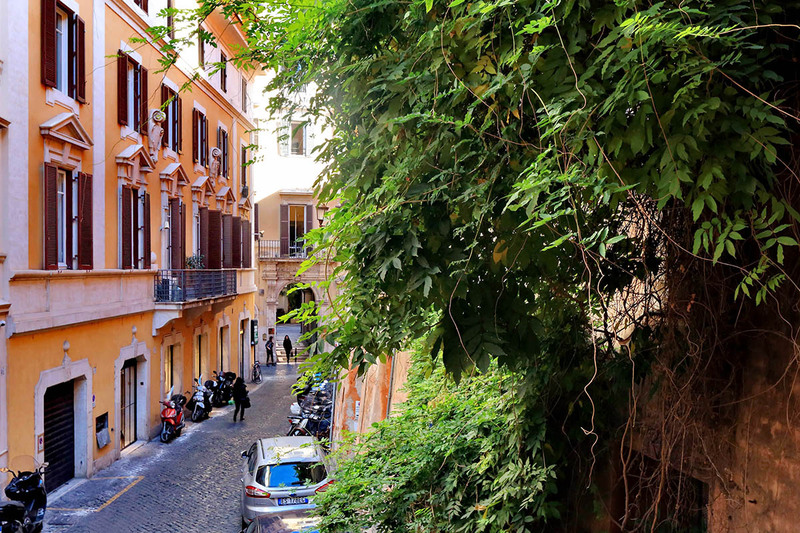 Our Rome oasis was a home away from home. We enjoyed having a glass of wine on the terrace after a busy day of sightseeing. With a convenient supermarket and a wide choice of other eateries nearby and being in walking distance to many attractions this apartment makes a well located base for a holiday. 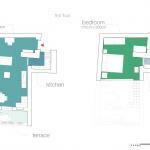 We were met by a representative who showed us around the apartment and was very helpful with location of supermarket. Rome Loft also arranged return transport for us from the airport which was fantastic. Enjoy your stay! Thank you for a very well organized stay in a typical well looked after and clean flat situated perfectly for the occasion. The staff was welcoming, on time and very friendly. See you again! 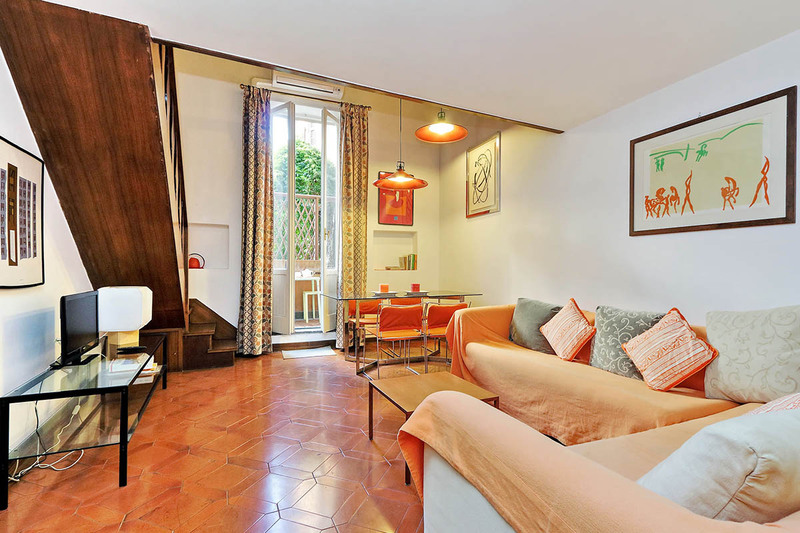 Furthermore, this unit has a charming balcony with vines overlooking Vicolo della Toretta and the surroundings. The balcony is also equipped with a table and chairs. On the lower level, you’ll find the living room that has a red sofa bed. Here you will also find a coffee table, a TV, paintings, and a stylish library. Adjacent to the sitting area there is a glass table with chairs. From the french window, with delightful curtains, there enters plenty of light. 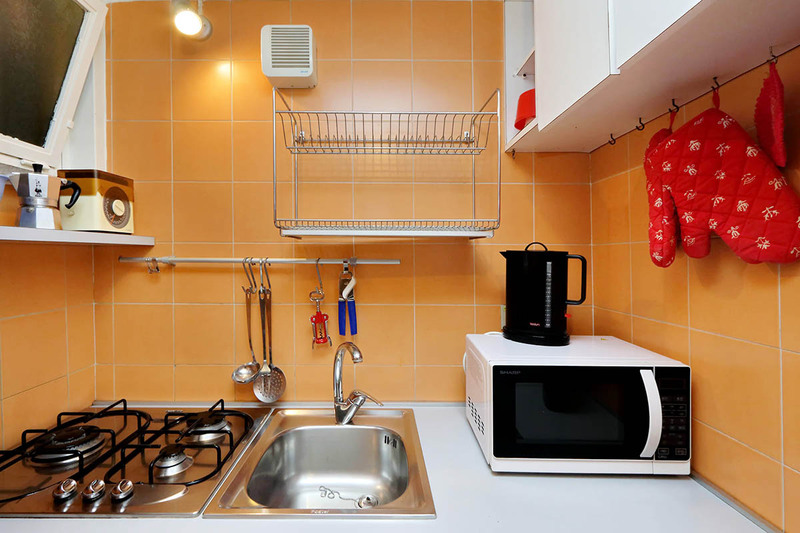 The well-equipped kitchenette offers a gas stove, an electrical small oven, a fridge, a freezer and a washing machine. This is the perfect place to cook up a delicious meal before relaxing in your roman home. 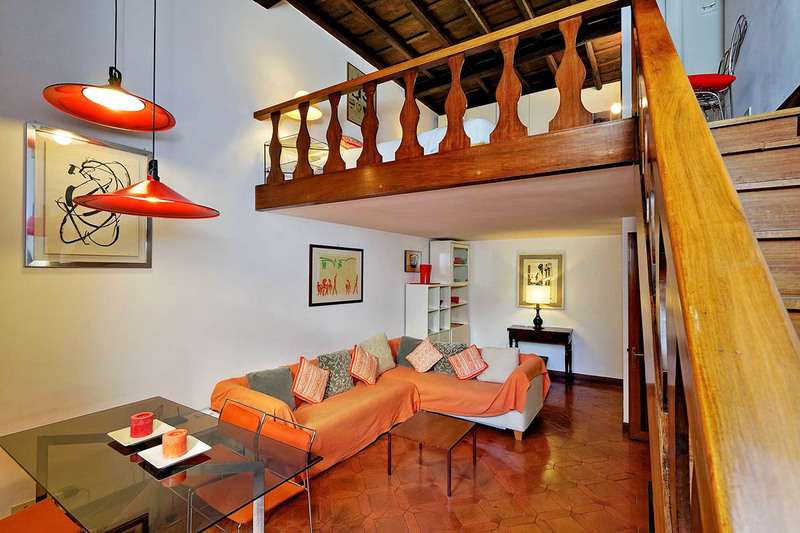 A wooden staircase leads you to the upper level where there is the mezzanine with a king size bed, night tables, lamps, closets, and the en-suite bathroom with a shower. 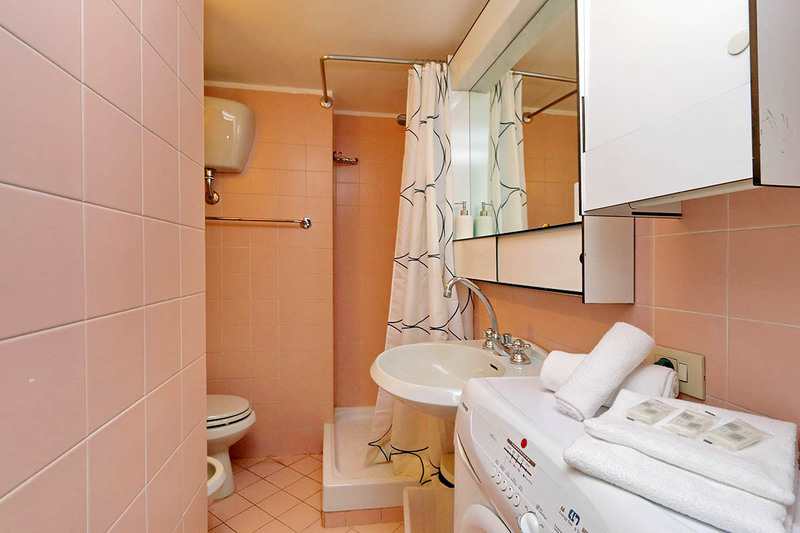 Central heating, as well as fans, complete this Campo Marzio studio apartment for rent. This unit is truly an ideal starting point for a family holiday. 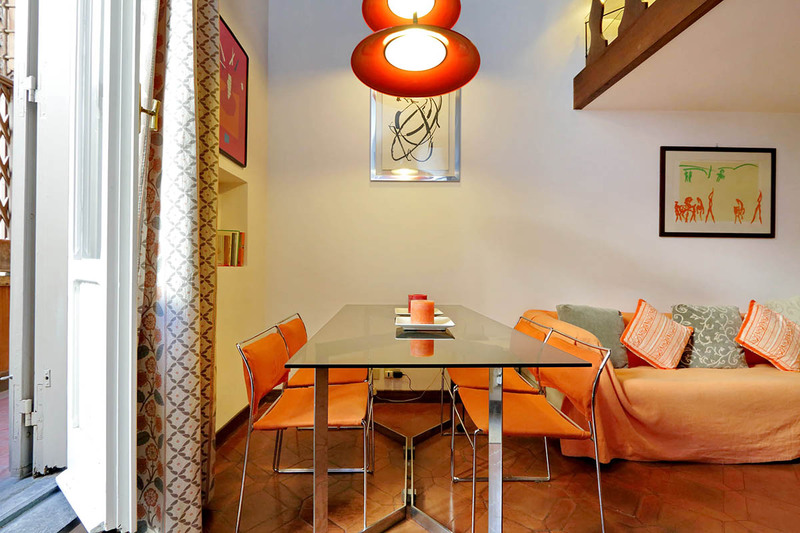 This apartment is just a few steps away from Piazza San Lorenzo in Lucina, in the Spanish Steps area. We also highly recommend you have a continental breakfast or a quick lunch at the famous Caffe’ Ciampini. There are many other elegant and stylish cafés, bars, and restaurants in the area, which make for the perfect surroundings in which to relax after a long day of sightseeing. Important attractions in the area include the Trevi Fountain, the Villa Borghese park, the Piazza del Popolo. Just a little further away you will find the Piazza Venezia, the Pantheon, and the Piazza Navona. We especially recommend visiting the Trevi Fountain at night. The later you go, the fewer people will be crowding around its edges to find an opportunity, and thus the more tranquil the atmosphere. In addition to this, the night-time illuminations add a certain magical glow to the already atmospheric structure. Fortunately, the Spanish Steps area is served by the Metro A. This will take you close to the Vatican, as well as the central station, Termini. From the latter, you can also catch the Metro B down to the Colosseum. This area is also a great place to go for a shopping spree. The streets surrounding the Via del Corso exhibit many designer and high-street shops, making it the ideal place to invest in some quality design items, or alternatively some style staples. The location could not be better and the apartment is great. Would be nice to have a few U.S. news stations on the tv. The hot water kept shutting-off and had to be reset at the gas panel. Needs to be repaired. Water in shower drains very slow. Other than these items the apartment was perfect very clean and well equipped. Check-in was easy as were ...Read Moreyour terms and conditions. 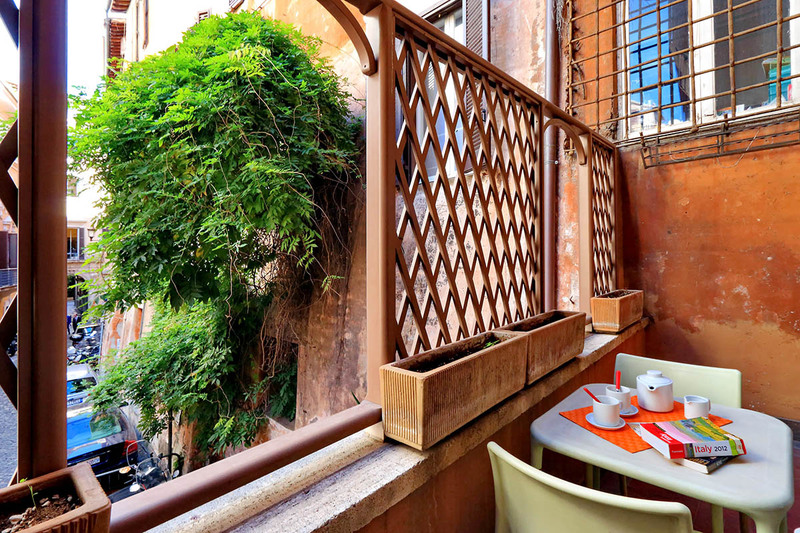 Will definitely choose Rome Lofts for our next visit to Rome. 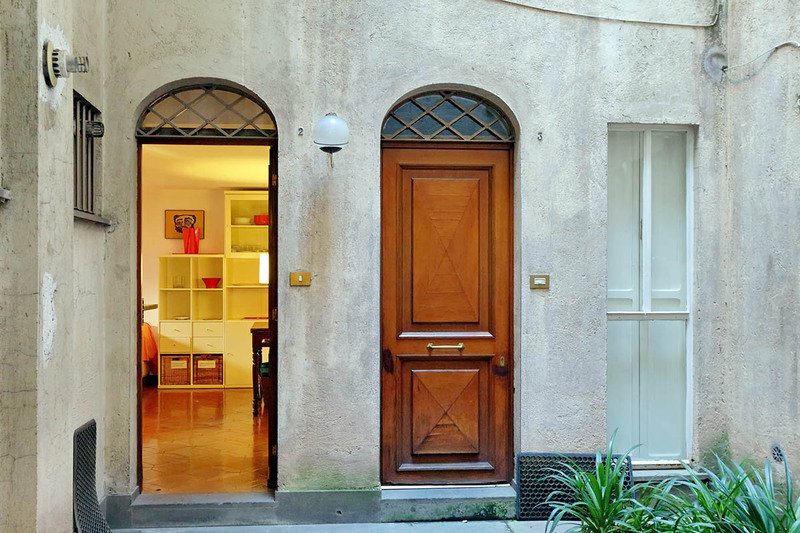 The location of the Campo Marzio apartment is excellent. We walked to all the major sites and enjoyed lovely meals close to the apartment. Was a pleasure to work with the Rome Loft staff--they were very responsive to emails and helped us book arrival and departure private transfers, which worked very well. The apartment is not luxurious but it...Read More is adequate. The A/C worked well and we took advantage of the clothes washer. The shower is small but worked. The kitchen is tiny but we only made coffee, so not a problem. The apartment is on a back street so was not noisy and was very secure. The elevator is tiny--we used it only to transport luggage. The rest of the time we used the stairs--only one flight. Overall, a very good experience. I have stayed two weeks in the Campo Marzio Apartement and I am extremely satisfied. 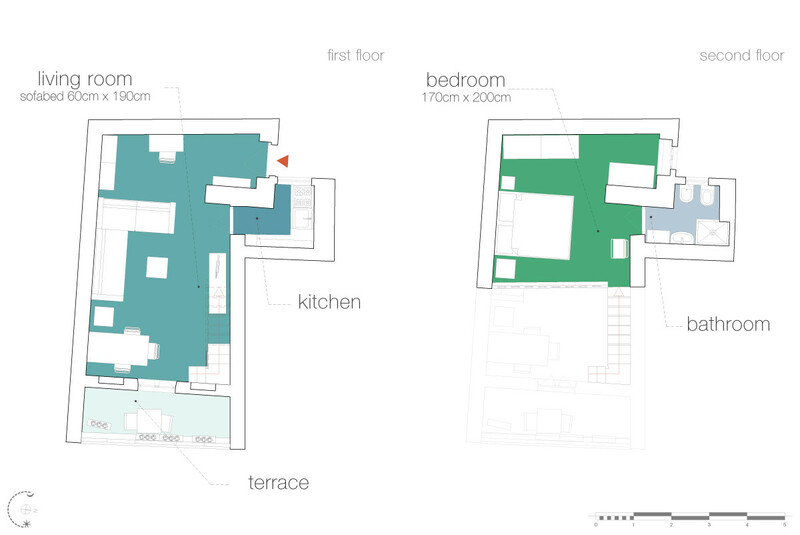 The flat is super well located and has all one needs for a comfortable stay. I was not happy with the pillows and the next day I have received another pair. I am very happy I have discovered the RomeLoft. Nowadays, it is a real pleasure to meet and to work with rea...Read Morel professionals. 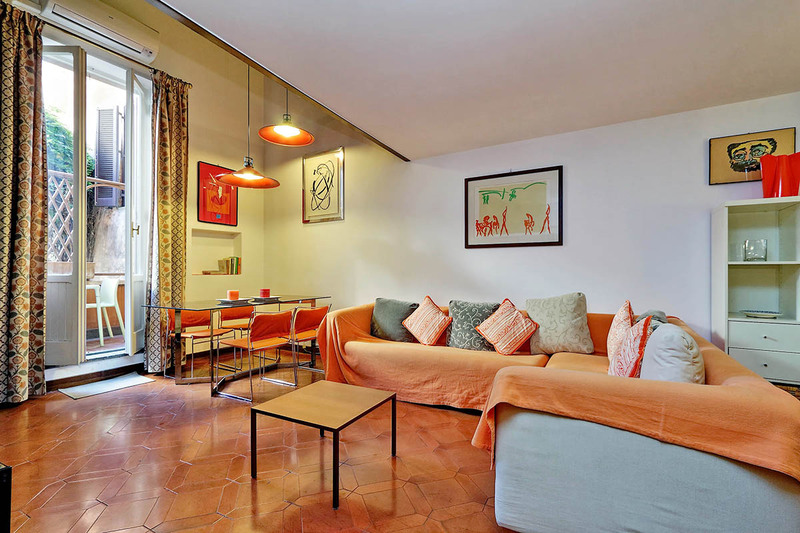 Apartment is very nice, well equipped, good instruction sheets for water heater & recycling (could have used one for washer), great location (half mile to Spanish steps and Metro, supermarket nearby, easy walking to river, Pantheon, Trevi) very happy overall. Check in was miserable: We arrived in Rome on a beautiful sunny day after an easy tra...Read Morein ride from Florence, ready to get settled and see the city. I had texted to the contact number the night before with train schedule and estimated time of arrival. I received a response so I thought communication had been established although I didn't actually call. Texted again as we left Termini in a taxi at 1:30 and again received a response, the ride took about 15 minutes so we arrived at exactly the estimated time I had texted the night before. When we arrived at the address we assumed we'd have to wait little while as the directions asked for a call 30 minutes before arriving. I was about to text again at 2:00 when I received an email saying "In 5 minutes I will be in front of the apartment". When I texted "Is there any hope?" at 2:25 again I was reassured, "On the way". It wasn't too long after that when a person appeared. When we expressed our displeasure at the long wait, he berated us for not calling to confirm arrival, he had no idea when we were arriving other than a rough time of 2:00 I had given when I booked the apartment. We showed him our string of texts and he said that was a random person in the office who was responding to us, As it turned out the random person was Nissar who was listed as the person to meet us in the confirmation letter, he was not the person who met us. It was not handled well and we were no longer the happy tourists we had been an hour ago. The magic of Rome helped to erase the bad feelings, but I have to say that this was our 5th private rental of our trip (4 others through airbnb) and all the others had gone quite smoothly. Everything else great, but don't expect to be greeted upon arrival. We appreciated the airport pickup and train transfer at either end of our stay. The driver was particularly courteous and the car was immaculate. The apartment itself was conveniently located in a pleasant area, nicely decorated and cleverly arranged. Most impressive was the amount and quality of equipment. We had everything we needed, especially ...Read Morethe speedy little washing machine. The dealings we had with the company staff, Sibela and Nissar, were excellent. They were very helpful and accomodating to ourneeds. I would stay with Rome Lofts again and would not hesitate to recommend them. 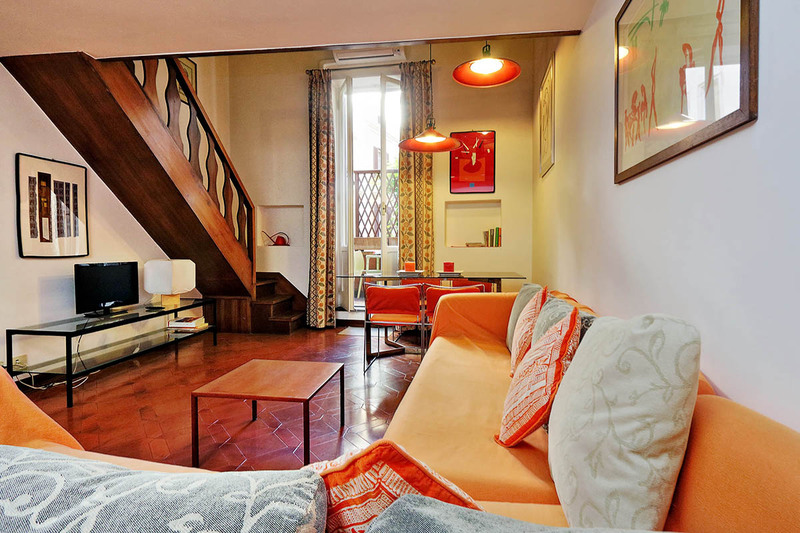 This is my 3rd apartment booked through Rome Lofts and I will definately use them again. The staff is very helpful and they have made our trip easy and comfortable. 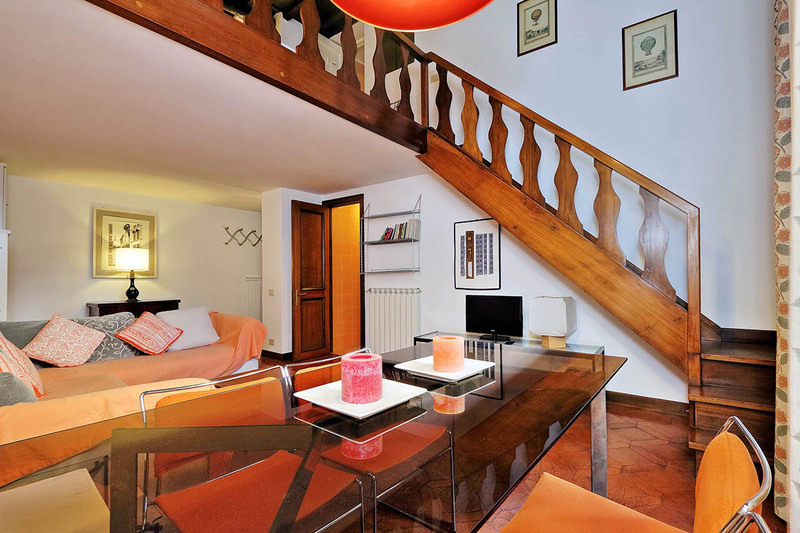 This apartment has a fantastic location, just 5 minutes away from the main shopping area and Spanish Steps. It is homely, cosy and great value for money. Perfect for a couple. Staying i...Read Moren an apartment is far better than staying in a hotel. On our second stay in this location we are still very positive, especially about he location. Some remarks: the seat of the toilet is still loose, like two years ago. We missed some salt and pepper in the kitchen. The tab in the bathroom needs decalcifying. Wifi functions as it should! Elevator is very useful at the end of a tiring day! Very nice...Read More and good restaurants and supermarket nearby for reasonable prices. Good starting point for shopping. We hope to come again. Lorenzo was a great host! He asked for all the information about us before we went to Rome ( Our flight etc) He proposed to arrange a car from the airport. On our first day, we left our camera in the taxi. Lorenzo and his assistant Matern were a great help. Whenever we needed, they were available. And it was great to live in an apartment, at the ve...Read Morery center of Rome, we walked everywhere, and had a great time. One thing: You still don't have wine glasses Lorenzo! Nous avons été ravis de cette location. Personnel très aimable au chek in. L'emplacement est idéal dans le centre historique près de la place Navone et la place d'Espagne. Parking payant Ludovisi possible tout près ou au bord du Tibre. L'appartement est charmant et fonctionnel pour un couple et une enfant. Un seul regret : Rom...Read Moreeloft n'a jamais répondu à nos deux demandes par email avant notre arrivée (demandes d'infos parking et couchage) mais le personnel au check in est sympathique. 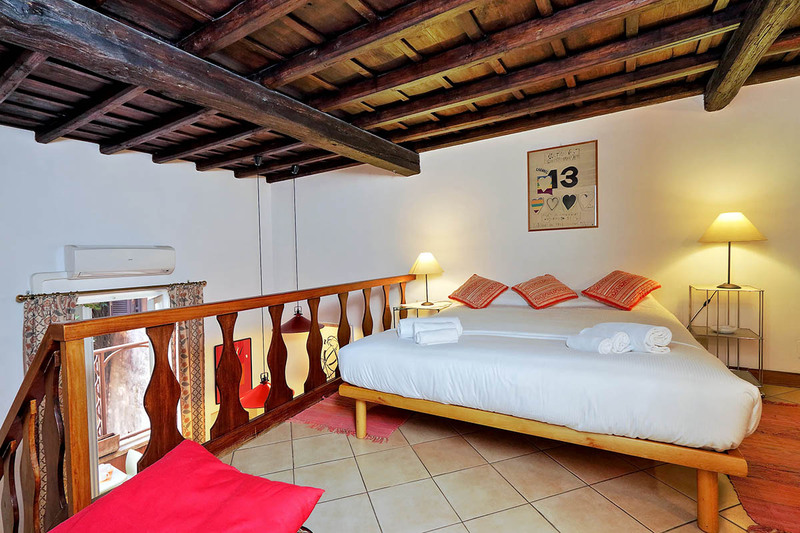 The apartment is very cosy in a antique romantic building dressed by ivy. During a long wknd my boyfriend and I we spent relatively quite a lot of time indoor since it's so comfortable that seems to be at home, nothing to share with a impersonal hotels. The little terrace is a plus, good for doing breakfast. 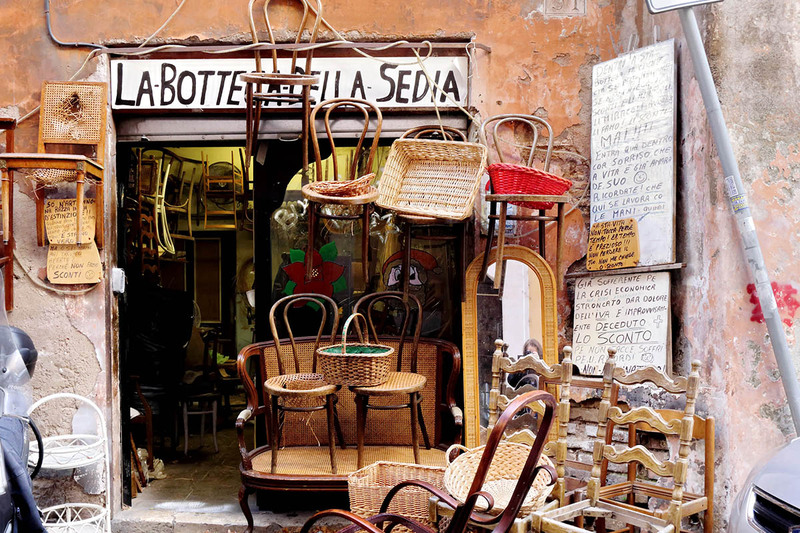 The area is the better one of Roma...Read More, since it is located between Piazza di Spagna, Trevi fountain, Piazza Navona, Fori, colosseum, Vatican, Trastevere quarter ..all in a walkable distance, a very safe and elegant area, full of restaurants, caffee, fashion shops. this apartment made our stay unforgettable. 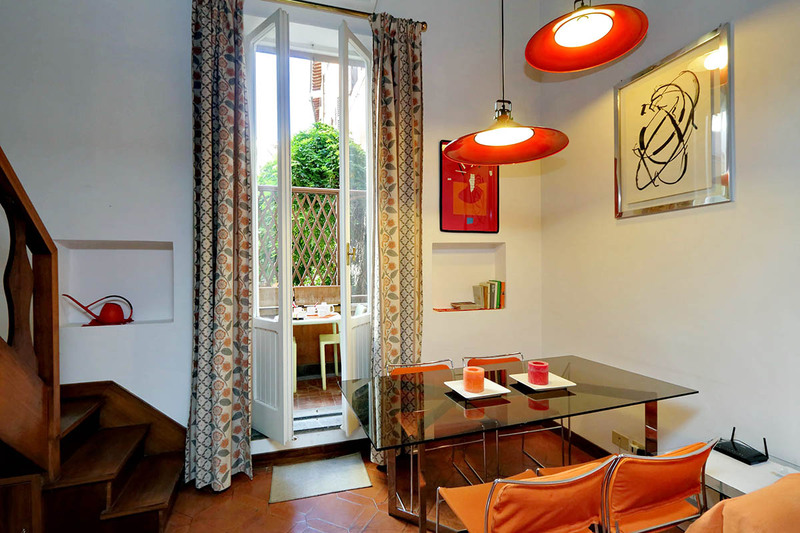 My stay at the Campo Marzio studio apartment was truly wonderful. I spent a few weeks in Rome by myself working on a research project, and this was the perfect place to stay. The terrace was great for eating breakfast, reading, people watching; the living room area was comfortable and spacious. 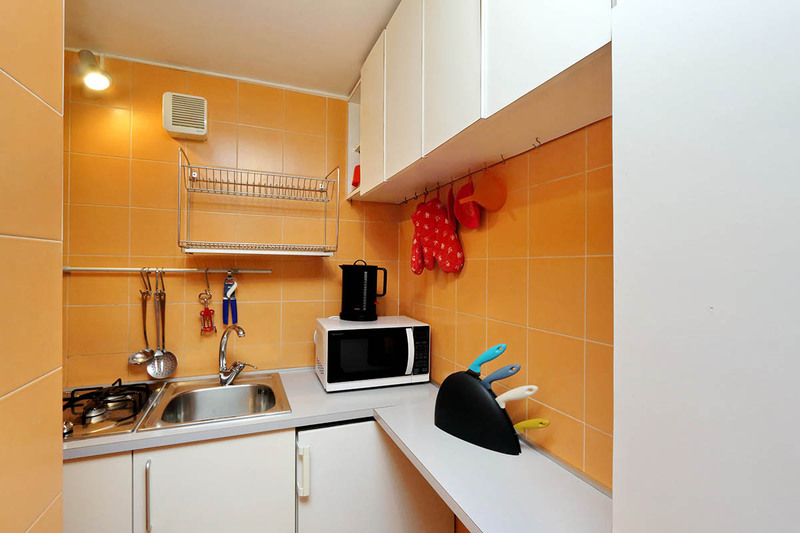 The kitchen is small, but that is the norm in Italy; i...Read Moret was big enough to cook some pastas/vegetables/basic foods, though it's big enough for just one person. The bedroom is lofted above the living room, with a large, relatively comfortable bed; it's nice because it doesn't just feel like a lofted bed, it really does feel like a separate space from the living room. The location of this apartment is fantastic. 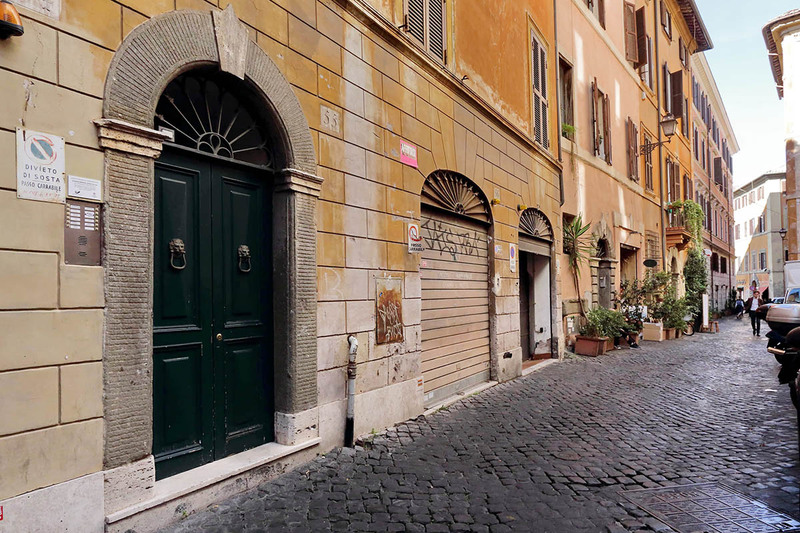 It's a 6 minute walk to the pantheon, 10 minutes to piazza del popolo, 12 minutes to the spanish steps. The neighborhood itself is so cute, with a few restaurants around the corner that are full of Italians. It really is a residential neighborhood. There's a supermarket just two blocks away, and lots of good shopping on the surrounding streets. This apartment was great for one person, but would also be great for a couple, or even three people, as the couch is very comfortable and folds out into a bed. I cannot recommend this apartment highly enough! 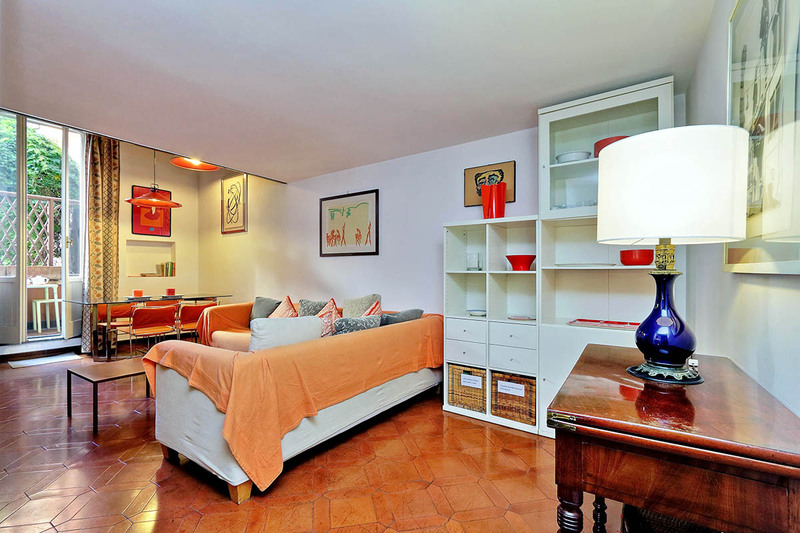 Clear, nicely decorated and well equipped, this studio apartment is above all perfectly situated in the heart of Rome. You are in the middle of the main highlights which means you can visit everything by walk. Just take a good pair of walking shoes we you. But temptations will be great to buy new ones because you also will be surrounded by shops! ...Read More There also small supermarkets a stroll away. 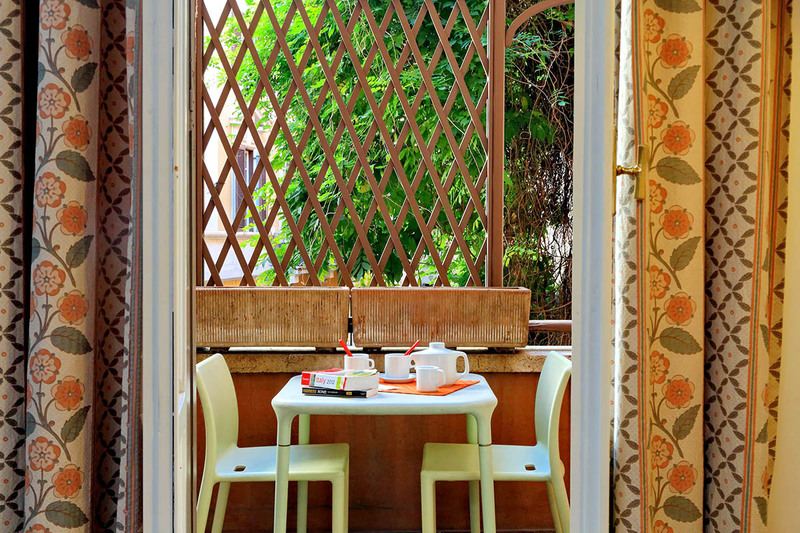 So you can prepare your breakfast and relax on the small terrace. What we enjoyed was to come back end of afternoon / early evening for a shower and a glass of wine to relax before going out. Because you will not want to eat in the apartment when there are so much good osteria around! Free wifi is also a bonus. We surely would come back here. What an amazing place to base ourselves for our week in Rome. 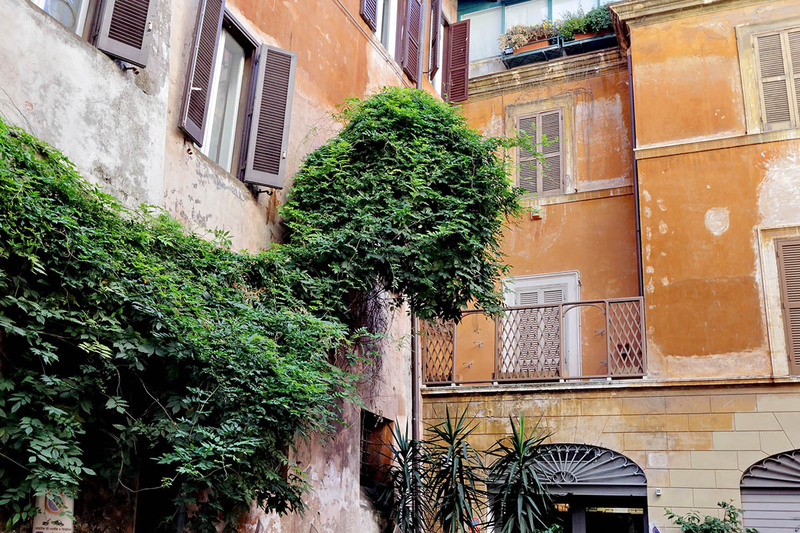 A perfectly romantic location, central to everything and providing the "we are living in Roma" experience that we wanted. 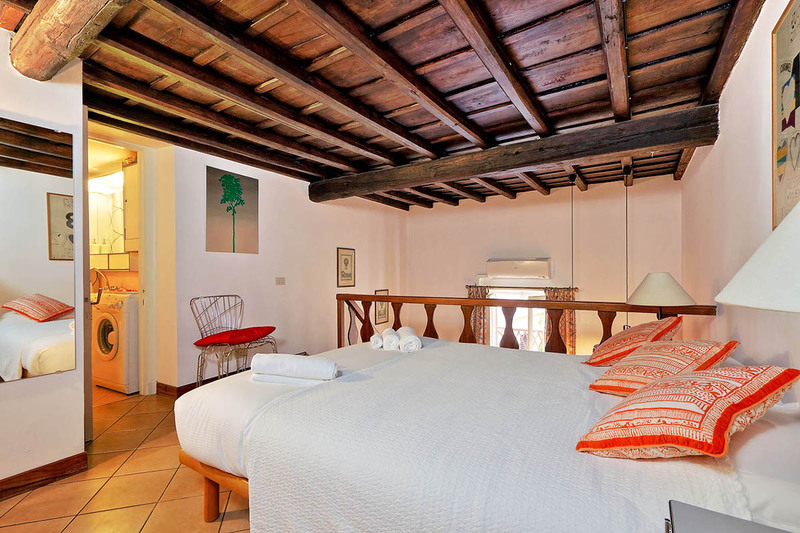 For value for money we will be recommending Rome Loft to our friends.